Putin hosted Assad in the Black Sea resort of Sochi on Monday ahead of a summit between Russia, Turkey and Iran and a new round of Syria peace talks in Geneva. Russia is about to end its military operation in Syria that tipped the scales in the devastating war in favour of government forces, President Vladimir Putin said at surprise talks with Syrian President Bashar Assad. Putin hosted Assad in the Black Sea resort of Sochi on Monday ahead of a summit between Russia, Turkey and Iran and a new round of Syria peace talks in Geneva. The meeting was unannounced and the Kremlin did not make it public until Tuesday morning. Assad has only ventured outside his war-ravaged nation twice since the conflict began — both times to Russia. This week’s visit to meet Putin is his second since the crisis began in March 2011 leading to a civil war that has killed some 400,000 and resulted in millions of refugees. The first was in October 2015, shortly after Russia launched its military campaign in Syria to shore up Assad’s forces. The Russian intervention has turned the war in favor of Assad. 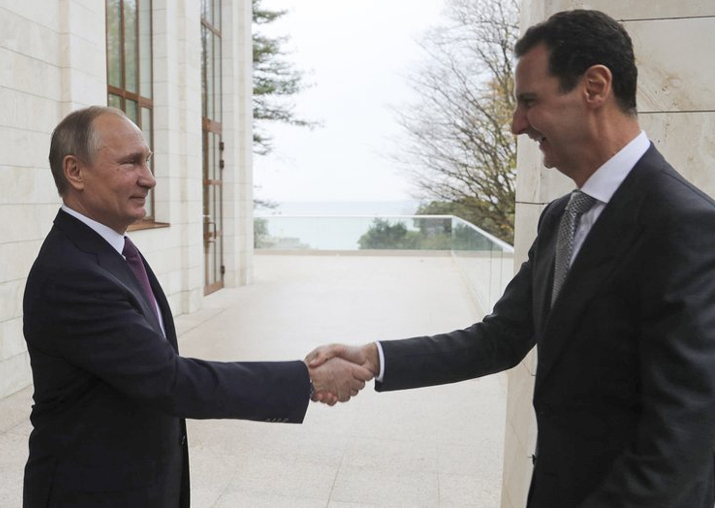 With the Syrian government controlling most of the country and Islamic State fighter in disarray Putin told Assad at the Monday meeting that Moscow is about to curtail its military presence there. The meeting came two days after Syrian troops and their allies captured the eastern town of Boukamal, the last major inhabited area held by the IS group in Syria. Syrian troops and their Iran-backed allies marched into the town under the cover of Russian airstrikes. Iran and Russia have been Assad’s main backers while Turkey supports the opposition.